So often we assume that "concentrated poverty," or poor people living near each other, is necessarily dysfunctional. Here are two counter examples. I’m in Lexington, Ky., this week for the National Community Land Trust Network conference, hosted by the Lexington Community Land Trust. The Lexington CLT had an unusual start—it was created as part of the mitigation of the impact on a very poor neighborhood of a road extension. The project itself, the Newtown Pike Extension, is fascinating. The neighborhood it runs through had been living in the shadow of a possible road coming through literally since the 1930s, leading to an extreme lack of investment. But after the neighborhood and supporters had fought back the plan more than once, a group of electeds and transportation engineers decided they were going to try again, but really do it right this time—listen to the community, redesign the road to lessen its negative effects, provide temporary housing to keep the close-knit community together, and put in the money to make sure that new homes are truly affordable and everyone who wants to stay can stay. They went above and beyond on the mitigation funding, making sure it worked for everyone rather than pinching pennies. For example, if you owned a home mortgage-free, your replacement home will also be mortgage-free even though its value will be higher. But here’s what struck me: The neighborhood in question, Davis Bottom, had an average income of under $7,000 a year. And this is what I never heard in the entire 90-minute, 6-person panel I attended on it: The words “concentrated poverty.” Here’s what I did hear quite often: “community cohesion”—as in, they had it, and it was so valuable that the project planners were bending over backward to allow it to be preserved. Here’s another thing I didn’t hear: “mixed income.” There will be more new replacement homes built on the site than needed for remaining residents, but they will all be on the land trust, and all designated as “affordable.” I’m guessing that some of them will be affordable at somewhat higher income levels than the relocated residents, but no one touted that as something they were looking forward to as a way to “fix” or “save” the neighborhood. The attitude was one of helping the residents rebuild their community, not of assuming they needed to be saved from it. Today, I watched a 20-minute clip of a film in progress, called It Took 50 Years: Frances Goldin and the Struggle for Cooper Square, about the fight against urban renewal that led to the preservation of the 22 buildings in the Lower East Side that make up the Cooper Square Mutual Housing Association, which sits on a community land trust to ensure its permanent affordability. The residents of those buildings, which before they won renovations were old-style tenements, were very poor. And they organized not only to stave off a Robert Moses plan to demolish their homes, but create a place where they could stay. Having survived planned shrinkage and divestment, they are now surrounded by sky-high Manhattan rents—and these low-income residents paid $250 to become shareholders in their new buildings and their maintenance charges are often under $300/month. Again, none of the outside observers in the film mentioned the potential depredations of keeping a “concentration of poverty” in these buildings. They talked about the incredibly well-organized community as a strength—a thing to fight for, and a power strong enough to take on City Hall and powerful developer interests. I don’t mean, of course, to say that all neighborhoods into which poor folk have been isolated have the same level of community cohesion as these places did/do, nor to argue that their poverty or lack of certain amenities is not a problem. But it was so refreshing to have these back-to-back examples of the fact that the problems we see in some of our most distressed neighborhoods are not the automatic result of a “concentration of poverty.” Poor people living together is not the problem. The poorest neighborhood in Lexington was physically isolated, wickedly disinvested from, polluted, and prone to flooding . . . and it was also racially integrated (and always had been), low in crime, and a very tight community. That won’t always be the case, but the point is, it’s possible. It exists. I think reminders like this could help us to not jump to conclusions about what is or isn’t going on in a neighborhood that is poor and to talk more carefully about the causes of the more difficult problems with things like crime in other places. It’s too easy to say “concentration of poverty” and let the assumptions flow forth, both about what’s wrong and what’s needed to fix it. Anyone working on these issues needs to approach each community without those assumptions in place. (Photo: Poster for film screening. 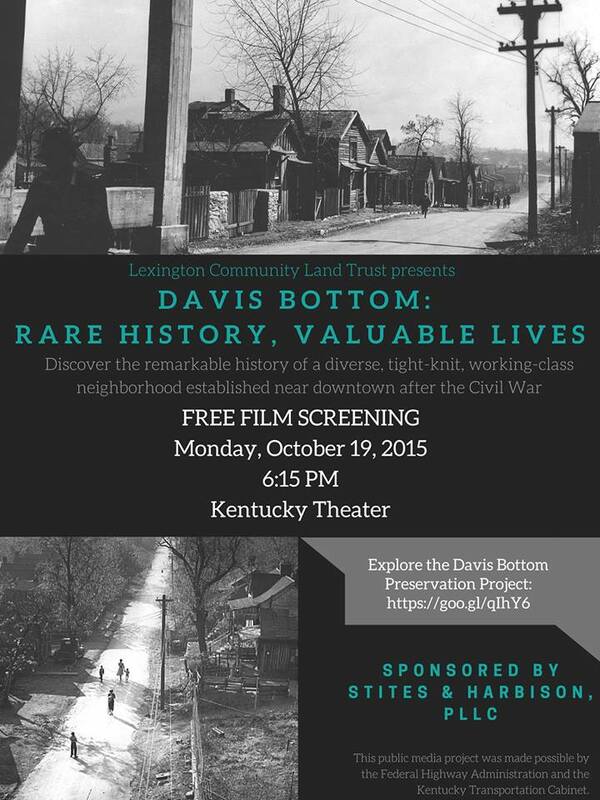 Learn more about the Davis Bottom Preservation Project here). Great article and observation! We have several areas in Charleston, SC where this has happened without the benefit of the favorable mitigation measures. It’s not too late to make some efforts to benefit the remaining remnants of these communities. There is also a new road going in that I haven’t heard anyone talk about the effect on the existing communities. Time to check it out! The Davis Bottom project was a real model of what could be done. My hats off to the Lexington Community Land Trust for a GREAT job of sponsoring the event!! !